The hammerhead shark is one of the fish that you’ll easily recognize when you see it. The unique shape that earns the fish its name is known as a “cephalofoil”. Hammerheads dwell in waters throughout the world where the water is warm. A hammerhead sharks can vary in its size, from a mere three feet in length to more than nineteen feet. The belly of the shark is white, which makes them trickier to spot but also gives them an advantage when they’re seeking prey. 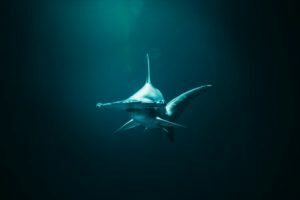 The hammerhead shark differs from other shark species in that it spends its time with large schools during the daylight hours before venturing off to do its own solo thing and hunt during the night. Octopus, stingrays, other sharks, and squid comprise a few of the species the hammerhead likes to have for its meal. There is more to the hammerhead’s cephalofoil than just its unusual shape. The shape of the shark’s head means the shark’s vision is enhanced. Due to the position of the eyes, the hammerhead can see what’s above and below it at all times. This cephalofoil is put to good use when the shark is hunting stingrays, allowing the hammerhead to pin down its prey.